Do you hate having to go to umpteen sites just to download your essential software to get your computer running? Do you hate then having to again go to umpteen sites again to check for software updates, and then downloading and installing them? Well I have the answer for you, it is call the Google Pack. Not only does the Google Pack include a wealth of Google software it also includes many non-Google software titles such as, Skype, RealPlayer, Adobe Reader, Norton AntiVirus 2005 SE, Ad-Aware SE Personal, Mozilla Firefox, and all the software is downloaded and installed according to your preferences. And as an added bonus there is a service that runs in the background called Google Updater and it will keep all of the supported installed programs updated to their latest and greatest version. 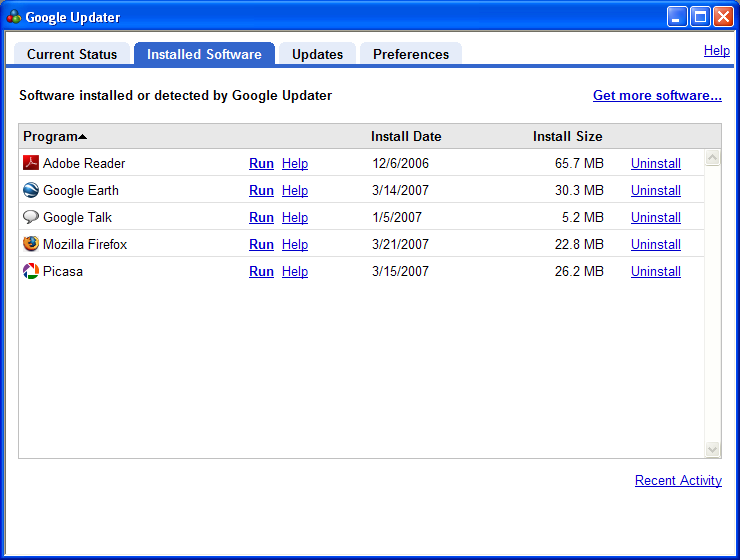 See image to the right for a screen shot of Google Updater. The following wealth of programs is one of the main reasons I recommend it along with Firefox on the left side of my site.